Yes I am still here. Sorry its been awhile. So much going on here. I don't know where to start. Well the week we went on vacation in October my mom ended up really sick and in the hospital in Alabama so we cut it short (very short) we only stayed one night in P-town then we headed off to Alabama. We drove down (26 hours pretty much straight through except for 4 hours rest). We stayed there one week until she was well enough to come back with us so we could help take care of her until she fully recovered. She has been sick since she had surgery in July. She just could not bounce back from it. She had one complication after another and the doctors down there just could not seem to find out what the problem was. I brought her here and within one week she was back in intensive care. After 3 weeks in the hospital here and lots of wonderful doctors and nurses she is finally well and is currently in rehab doing physical therapy in order to get strong again to walk unassisted and to be able to do activities of daily living again. It has been a long road but I think she will be fine now. As far as the pregnancy goes I am now 10 1/2 weeks. The only symptoms I have had so far is a little nausea and feeling very tired (almost to the point of exhaustion at times). 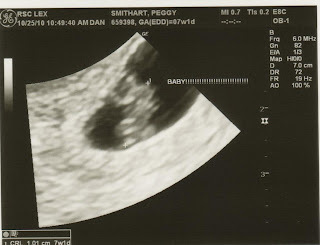 We have had one ultrasound at 7 weeks and we got to hear the beautiful heartbeat. And we had one at 9 weeks due to me having some spotting which was very scary but turned out to be nothing. We were released from our fertility clinic at 7 weeks and are now with our Ob/midwife group. I got to stop the progesterone inserts this week because my level was 43. I was happy about that because I feel those made me more moody and tired. I go day to day still in disbelief of the fact that we are finally pregnant and I have a little baby inside me. Each time I get to look at that u/s screen and see it and hear the heartbeat I just amazed and in love. We go for our next u/s Dec 1 and we can't wait. We came up with a name that we will use to refer to the baby on the blog and actually it is what we use all the time to refer the baby. It is Wynken. The way we came up with this name was when we first went for the u/s to see how many eggs we had for retrieval for the IVF and we found out that we had 3. So we named them Wynken, Blynken, and Nod from the book by Eugene Field. Then we found out that only one survived fertilization so we stuck with Wynken and ever since that is what we have called it. So Wynken it is. J even went out and bought the book for the baby. So cute. Congratulations to those that have recently gave birth to those beautiful babies. I hope I get time soon to comment. that's scary about your mom, but I'm glad to hear she's on the road to recovery and that you were able to help nurse her back to health! Also glad to hear everything is going well with Wynken (adorable!) and that you get to stop the progesterone! Sorry to hear about your mom, but glad to hear from you again!